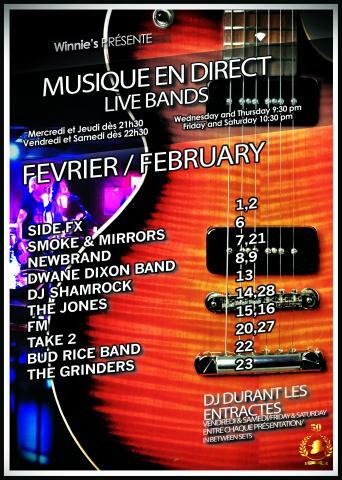 The second level of Sir Winston Churchill Pub Complexe hosts live entertainment starting on Wednesday and continues through to Saturday. Here is the line-up for the remainder of February. On Friday, February 8th and Saturday, February 9th, the ‘Dwane Dixon Band’ returns again from last month. In fact, this group have been performing monthly for the crowd a Winnie’s for some time now. ‘DJ Shamrock’ will be entertaining the crowd on Wednesday February 13th. No better way to chase away the ‘Hump Day’ blues. ‘The Jones’ is on deck for Valentines’s Day, Thursday February 14th. No better way to celebrate the evening with your loved one. Start time is at 9:30 PM. This group also returns Thursday February 28th for an encore appearance. The popular group ‘FM’ will be on stage Friday February 15th and Saturday February 16th. ‘FM’ are always good for a great night of music and dancing. ‘Take 2’ have two appearances at Winnie’s. The first is on Wednesday February 20th and the following Wednesday February 27th. ‘The Bud Rice Band’ will be on stage Friday February 22nd and ‘The Grinders’ return to Winnie’s on Saturday February 23rd. There is always something happening at Sir Winston Churchill Pub Complexe located on Crescent Street in downtown Montreal. After all, Crescent Street started with us back in 1967 and we are still here providing great entertainment value.